The Kissed Mouth: Birthday Competition - The Results! Well, here we all are and cake all round! Yes, I was the big four-oh yesterday and thank you everyone for the marvellous entries for my competition. So who did I knit....? But no, none of them. However, we all know he'd far rather be hanging out with a wombat, scoffing the bottom end of a hedgehog birthday cake. Seeing as you all put the effort in and made me smile, you all get a signed copy of Stunner and my love for such marvellous crafty Pre-Raphaelites! The other person who guessed correctly was the marvellous Raine Szramski who already has a signed copy of my book, so she gets a big kiss, virtually. Yes Raine, I shall now knit a little Edward Burne-Jones to keep Topsy company. 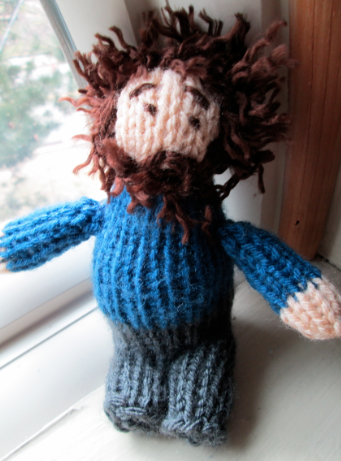 A little knitted Swinburne would be quite the thing, but I am looking forward to seeing your Edward Burne-Jones. Maybe knit him with a copy of Morte d'Arthur and a fencing foil, from his University days? Love him! My poor William is often left out - wish I'd have guessed him correctly. Loving all the other creativity too - yes to a PR knitting book! 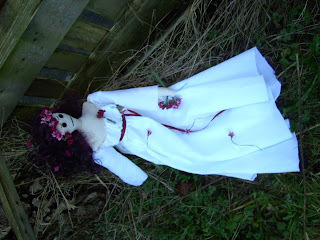 And that Ophelia is somehow so touching... a tragic scene translated into the innocence of a doll. Congrats to the winners! And he's a bit of a stunner himself, if I might make so bold.